This isn’t necessarily a “recipe” so much as a meal idea I stumbled across in the throes of overwhelming hunger desperation, to avoid yet another meal of cereal and wine. I’ve already shared my love of brussels sprouts, including this delicious, easy caramelized shredded brussels sprouts (and much faster than roasting them in the oven!). 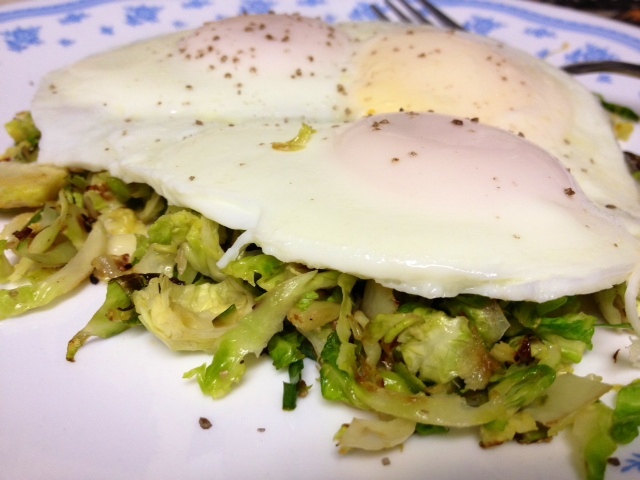 So one night, I had a few brussels sprouts sitting in the fridge I knew I could make up, but that wasn’t going to cut it for dinner. 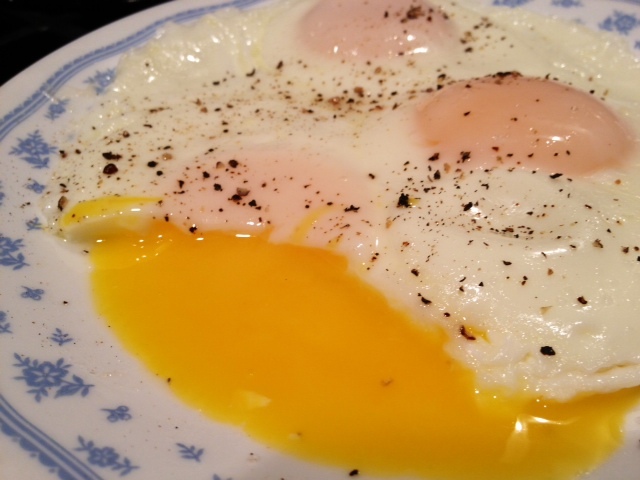 So I decided to baste up some eggs for a protein kick. 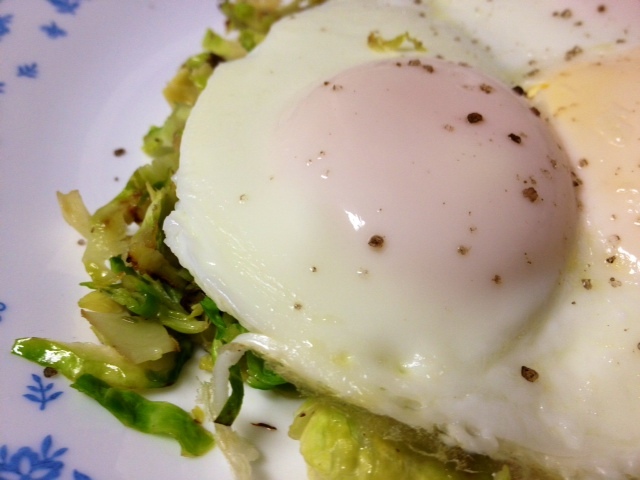 What was great was how the egg yolk (I like mine on the runny side) mixed in with the brussels sprouts. 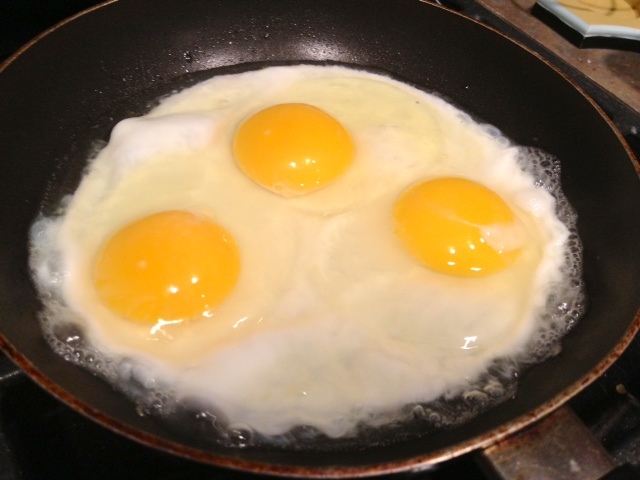 What is a basted egg, you ask? Well, friend, I will tell you. 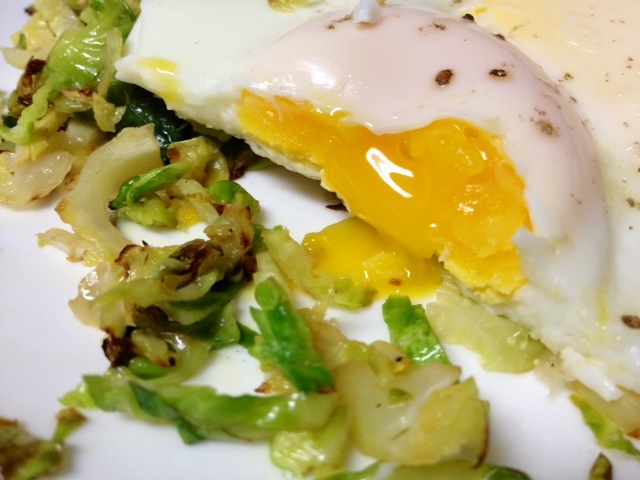 It is a super fast way to cook eggs, and somehow not super widely-known. It’s somehow between fried (which I never ate growing up) and poached (which, well, that is complicated and takes a while). 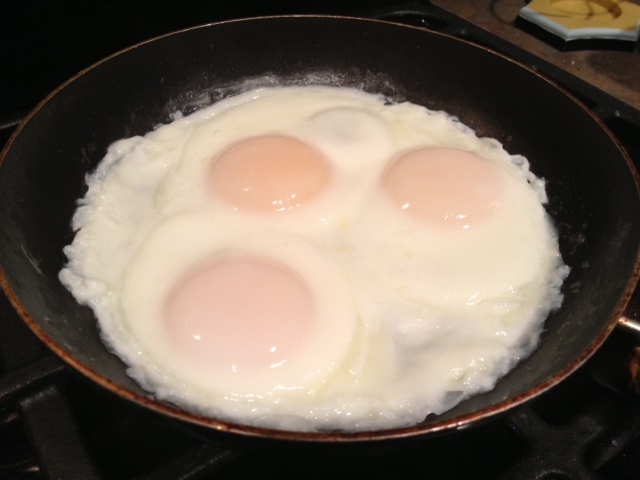 It takes like five minutes, and you can make the yolk or whites softer or firmer, just depending on your preference. Take a small pan, heat on medium or medium-high and spray with non-stick spray. 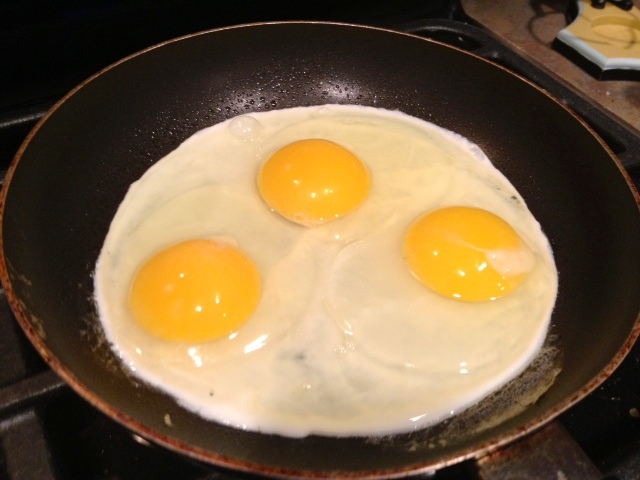 Once the pan is hot, break the eggs into the pan, making sure not to puncture the yolk. I mean, the world doesn’t end if you do, you just don’t get the pretty yellow mounds. 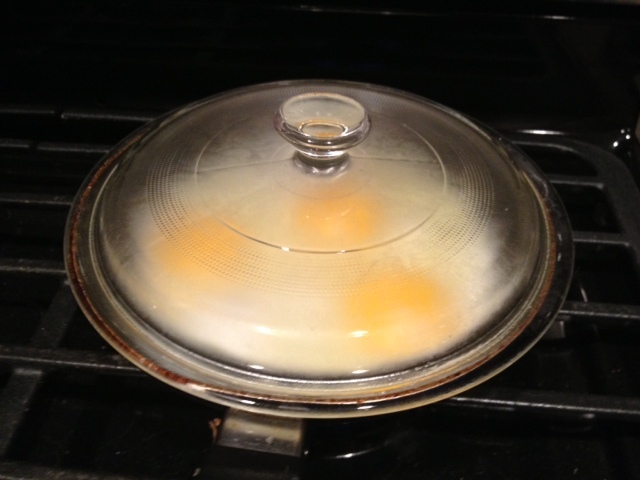 Once a strong white film has formed under the eggs, pour some water in around the edges. Not an exact amount, maybe like a quarter cup? As you make them more often, you’ll figure out what works best on your stove. Cover with a lid or plate and let cook for a few minutes (3-5 probably). They basically kind of poach themselves, without all the fuss. This is where the water comes in—if you put too little in then your eggs will be waterier, but too little will make the eggs kind of tough and dry. Neither ruins them, just a preference thing. This is what it looks like. You can see the water is basically gone. Salt, pepper, and perfection. You can throw leftover chili and cheese on there, salsa, whatever floats your boat. oh wow! i never heard of this technique, but it looks easy! Interesting egg technique – another thing to try – thanks!